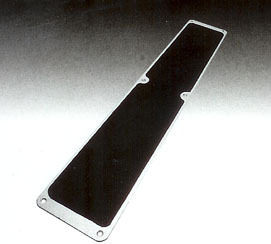 These prefabricated anti-slip plates are available in a variety of shapes and colors and are made of weatherproof aluminum and our coarse anti-slip adhesive tape. Bolts or screws are countersunk. Pictured above is our standard size: 4 1/2″ x 25″, thickness 1/16 inch, $28.95 per plate. Call (1-800-988-6721) or e-mail us to order customized plates – different sizes, colors, and tape coarsenesses are available for very large orders. FREE shipping for orders over $120. Contact Us now to discuss your slippery floor, bathtub and shower issues. We're here to help!